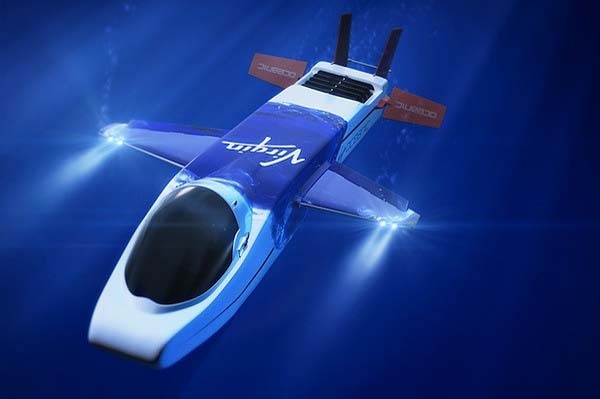 Virgin Airlines founder Sir Richard Branson just introduced the first one-man submarine that can travel to the deepest parts of the ocean. Is really deep sea travel a reality now? Virgin CEO Sir Richard Branson just announced that he’s adding a new method of travel to his menu of air and space travel: Deep sea travel. Branson unveiled plans to launch his one-man submarine – the Virgin Oceanic – with the goal of taking it to give points at the bottom of the sea. Branson will pilot the craft to the deepest point of the ocean to help scientists “understand our eco system and raise awareness of the challenges facing our Oceans,” Branson said in a statement. Ultimately, it’s said that the deep-sea vessel will allow us normal people to travel down the ocean’s depths. We love the idea – and we think Branson is the only person that can really make it work. Would you ever travel to the bottom of the ocean in a one-man submarine?